Pollution Control and Resource Recovery: Sewage Sludge discusses several traditional and new environmentally friendly technologies for sewage sludge treatment and disposal. In addition, the book covers a range of new initiatives that are underway to promote and accelerate the development of related sciences and techniques. 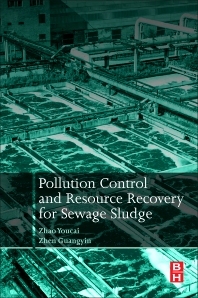 The book's authors builds a framework for developing various sustainable technologies for sewage sludge treatment and disposal, including advanced dewatering through chemical conditioning, solidification/stabilization, reuse for the development of construction and building materials, anaerobic bioenergy recovery, sanitary landfill, and odor control. Zhao Youcai, is currently a professor of environmental engineering at School of Environmental Science and Engineering, Tongji University. He had authored or co-authored 138 publications published in the peer-reviewed internationally recognized journals, 420 publications in China journals, authored or co-authored 75 books (as an author or Editor-in-chief). Zhen Guangyin, is currently JSPS research fellow at the National Institute for Environmental Studies (NIES), Japan. He received his BEng Degree in Environmental Engineering from Hunan University, China in 2008 and his Ph.D. from Tongji University, China in 2014. Prior to joining in the NIES, he worked as a visiting researcher at the Tohoku University, Japan. He has authored or co-authored 26 peer-reviewed international papers, 5 Chinese papers and 4 invited book chapters. His principal research interests lie in sewage sludge treatment and renewable energy conversion (anaerobic digestion, microbial electrolysis cell, etc. ).